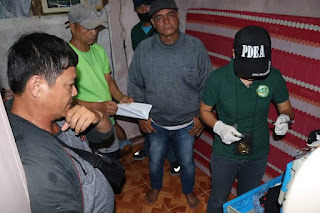 LEGAZPI CITY (Bicol Standard) -- A couple who is in the Regional Target List of the Philippine Drug Enforcement Agency (PDEA) was arrested by a team composed of members of the PDEA, police, and National Bureau of Investigation (NBI) by virtue of a search warrant. Manuelito Jacobe y Bernal, 48 years old, and Gloria Jacobe y Obogne, 47 years old, residents of P-1, Brgy. Puro, Legazpi City were apprehended on Tuesday night for violation of Republic Act 9165. More or less 25 grams of suspected shabu with an estimated value of P150,000.00 and other drug paraphernalia were confiscated from the couple. The Jacobes are presently under the custody of PDEA Bicol.